I believe that the semi-private blockchain application segment will be the upcoming hot flavor in the blockchain world of software applications. 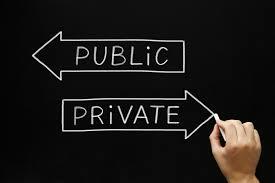 For background, one of the primary differences between public and private blockchains is that public blockchains typically have a generic purpose and are generally cheaper to use, whereas private blockchains have a more specific usage intent, and they are more expensive to set-up because their operating details are borne by fewer stakeholders. Blockchain Applications can use either public or private blockchains infrastructure, and sometimes they will use both. 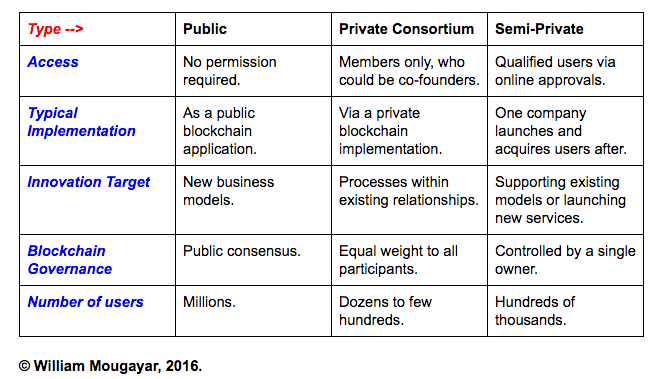 Among these choices of implementations, lies a nuance: the semi-private blockchain application. In contrast to public chain applications where anyone can participate, and private chain applications (consortium or not) where participants are tightly managed, semi-private chain-based applications are run by a single company who grants access to any user who qualifies, and they typically target business-to-business users. Semi-private blockchain applications will be similar to private Web applications in terms of how they are managed. As long as users qualify according to pre-established criteria, credentials or profile, they are given access. There should not be significant discrimination for access. And in some cases, access might be completely open. For example, when we check the tracking status of a package on a carrier website (FedEx, UPS or other), we don’t need to identify ourselves, but we just enter the tracking number. In the near future, companies will provide “trust-related services” that consumers can use to check a particular status or update. Here’s a quick table depicting these variations. Examples of semi-private blockchain applications might resemble the ones that we hear government entities are planning to launch, such as record-keeping, land titles, public records, etc. They could also come from any company who launches a blockchain application to serve their business. Just to name a couple of examples in this category,- the Chicago Cook County property title transfer application, or the Thomson Reuters identity tools application. Launching them most closely resembles how a company runs a website. The business case is typically well thought out ahead of the implementation, and it supports an existing business, so the risks of failure are low. Companies can more easily integrate blockchain features into their own back-end and meld it with a familiar Web interface. They control all of that directly. I’m bullish on the semi-private flavor of blockchain applications for large companies. Possibly, semi-private blockchains might become the preferred way to introduce applications that have a blockchain component behind the scenes. With the proliferation of public, private, semi-private, special purpose, and other types of blockchains, a world of millions of blockchains will be achievable.